In this fast pace life, one hardly gets time to share a meal with their family members. Dining room is the small corner at our home which is a place for rendezvous. Dining area is not just to have a meal with the family but brings in the timeless discussions and togetherness that gets skipped due to our busy life. In the past, dining room was an iconic place where conversations on rich, valuable topics were done helping the younger ones in the family to learn and tie with each other with thread of love. Thus people had been trying to carve that dining niche in their house with various stunning ideas to make it look as a prime area of their home. Below is a collocation of splendid dining room designs for family who believes in “Eat, Drink and be Merry”. A simple and serene dining room decor is the best to foster a memorable evening over a meal. This modern dining room features elegant and minimal furniture with porcelain crockery. It can also be made more alluring with addition of a wine cabinet personifying the spectrum of modern style possibilities. Unornamented yet stylish is the aesthetic feature of this type of dining room. 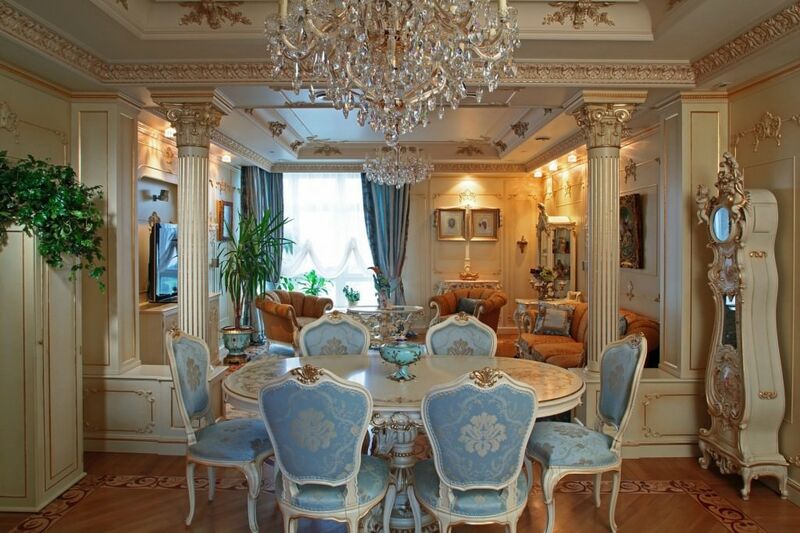 These kinds of dining rooms are for the ones who crave for royalty and luxury. Mostly it will have an inclusion of aristocracy and supremeness with ornamented chairs, crockery. The aesthetically designed chandeliers along with wooden carved furniture and wall lamps are alluring to the eyes. An eclectic dining room with tint of beige and golden is the paramount element of this type of dining room. France is a land of beauty, style and exquisiteness, and French is known as the language of love. So if you are a fan of this utterly charming country then you should try this picturesque dining style. French style dining rooms can be Classic or rustic. The colors are generally calm and pastel, with white flowers, crystal chandelier along with a bottle of wine thus infusing the space with elegance and romance. Bon appétit is what I will say. If you are a fish lover, then this type of unique dining room design is impeccable for you. 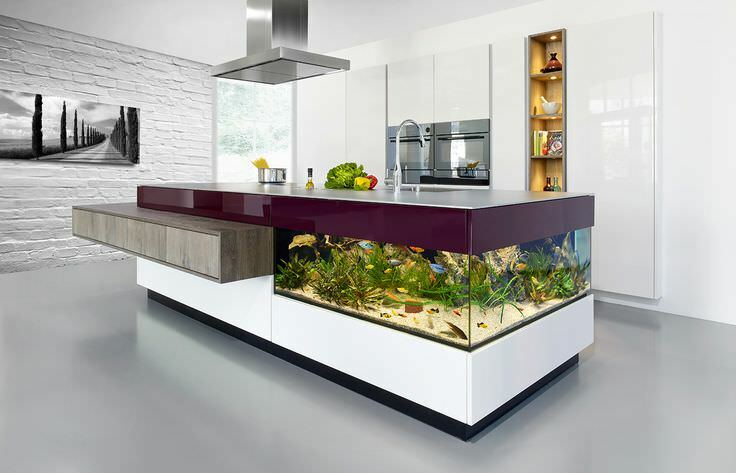 You can build in your aquarium in your coffee table, kitchen cabinet or kitchen counters and can have a meal watching the fishes whilst they watch you. This incredibly helps in usage of the kitchen space making your dining space look exotic. Who wouldn’t like a breathtaking view of the sparkling ocean water kissing the sun rise golden sand beach with each playful wave? 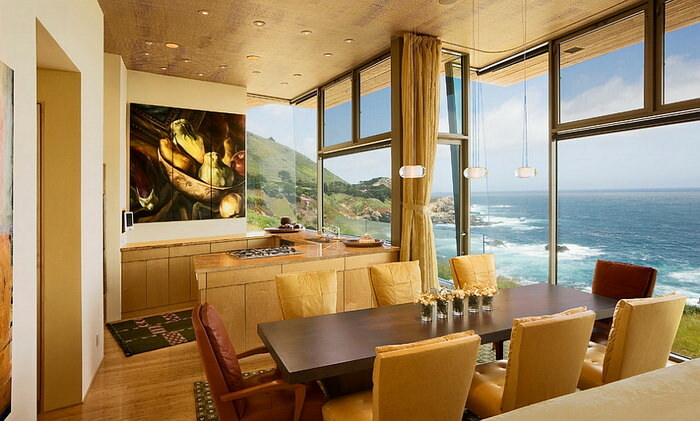 Having a dining room with ocean as the backdrop will be soothing and invigorating with the sound and symphony of the waves tuning together. Such jaw dropping beauty is ideal for someone who aspires to be in nature’s lap and thus can go for this type of dining room designs.